Hey kids!!! Happy Friday to you all! I know you all know what day it is ....yep!!! It's Fertilizer Friday!!! 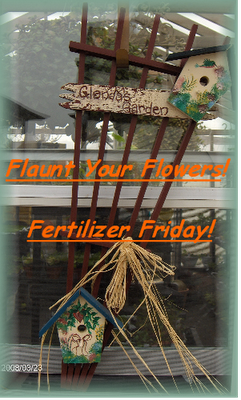 Now, on this special day of every week, we grab our fertilizer, our watering cans/hoses, or whatever it is that you use to feed your plants....and we give them a good swift kick in the roots! First, fertilize your flowers, and houseplants....then take some photos of those most beautiful blooms or foliage....and then post them to your blog. Once you have done all of that...come back over here, and grab the photo above, and put it in your blog post to link back to my blog. Then, last but most certainly not least....add yourself to the mister linky below, so that everyone can come for a tour of your blooms! Now is everybody ready????? FLAUNT YOUR FLOWERS! I do not have anything to flaunt for you today. I am not even in the area of my garden. I am having a planned getaway with a few good folks! When I return home...if there is anything left to flaunt....I will! For this week it is up to you guys to flaunt and inspire us all by yourselves!